I am so saddened by the events of April 23, 2018 where the suspect of a terrible act of destruction, 25 year old Alek Minassian stepped into a Ryder Van with the intent of using this vehicle as a weapon to harm others. 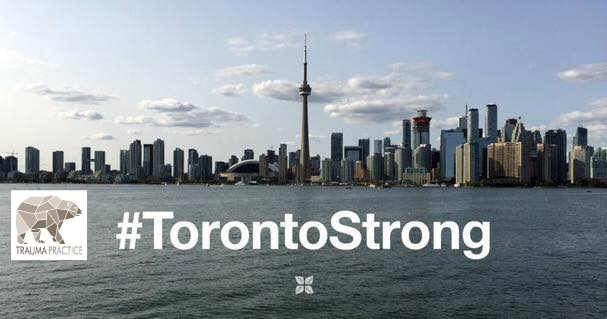 I am sad for the quiet North York community, where as I keep hearing "these things don't happen". Where the assumption of safety has been shattered. I am saddened for those families who have lost loved ones or faced terrible injury. I am left wondering once again, why it is that this act of violence seemed like some kind of answer to Mr. Minassian. Why did he feel so disenfranchised, confused and without a meaningful way to deal with his inner pain that he turned to such an extreme act of violence? This to me continues to be such a crucial question, as terrible acts once again tear through another community. What is it about this desperation that leads a young man to undertake such a vicious act? Police are saying it is too soon to make any conclusions about the motivations of his actions. Yet, where is the sense of being part of a larger human community, focusing on kindness on generosity and meaning? What was happening for Mr. Minassian that his answer was something that tears people apart and leaves a sense of terror and confusion? What are we missing in our communities that a man cannot find solace, understanding and connection but instead chooses violence and meaningless destruction? For those who have been shaken up by the terrible events yesterday, please be aware that this type of event can shake up our sense of safety, ignite our nervous systems to turn on our fight or flight response and leave us feeling exhausted and hopeless. Our bodies naturally respond to get us out of harm's way even when the danger has passed. This means that we can feel on high alert, quite depleted and frightened for days after an event like this. Our startle response to loud or sudden noises can react powerfully. If we have a personal trauma history, this type of event can re-ignite our own sense of emotional distress that has to do with a traumatic past. This is the time to be gentle with yourself, walk, drink water, and seek out the kindness from those in your life. Find ways to remind yourself of what is most important: community, kindness, and love. Recognize that you might feel more fragile emotionally and that this is a normal response to exposure to an extremely threatening event. You will need to be gentle and understanding with yourself and those in your life. An act like this does not mean that we are always at risk but our bodies, minds and nervous systems can feel on edge for days. Put this in context. After these types of incidents, we can feel like we are constantly scanning our environment for potential risks. Understand that from an evolutionary perspective, it is a safety response that will need time to settle down. Continue to focus on being part of your community, find ways to feel like you belong, bring meaning into your day (even in the simplest of ways – be kind to someone, be understanding if someone is struggling including yourself). Be gentle with yourself and those around you. These are tough times and they demand we respond with great compassion.